The Mercedes-Benz G-Class or G-Wagen (as it was called from 1979 to 1994), short for Geländewagen (or cross-country vehicle), is a four-wheel drive vehicle / sport utility vehicle (SUV) produced by Steyr-Puch (now Magna Steyr) in Austria for German automaker Mercedes-Benz. The G-wagen is characterized by its boxy styling and body-on-frame construction. It uses three fully locking differentials, one of the few vehicles to have such a feature. Despite the introduction of an intended replacement, the unibody crossover SUV Mercedes-Benz GL-Class in 2006, the G-Class is still in production and is the longest produced Mercedes-Benz in Daimler's history, with a span of 32 years. The G-class was developed as a military vehicle from a suggestion by the Shah of Iran (at the time a great shareholder) to Mercedes and offered as a civilian version in 1979. The G-class replaced the cheaper Volkswagen Iltis in 1990. In this role it is sometimes referred to as the "Wolf" and LAPV Enok. The G-Class has been sold under the Puch name in certain markets, and the Peugeot P4 is a variant made under license, with a Peugeot engine and different parts. 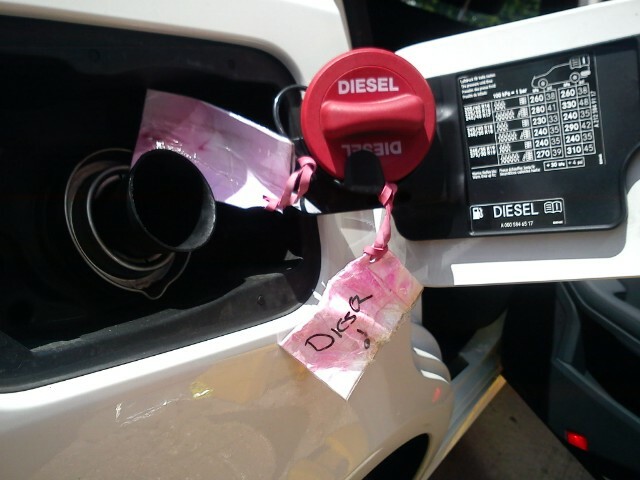 Forecourt Assist were recently called out to a repeat offender of a 'misfueled' vehicle. 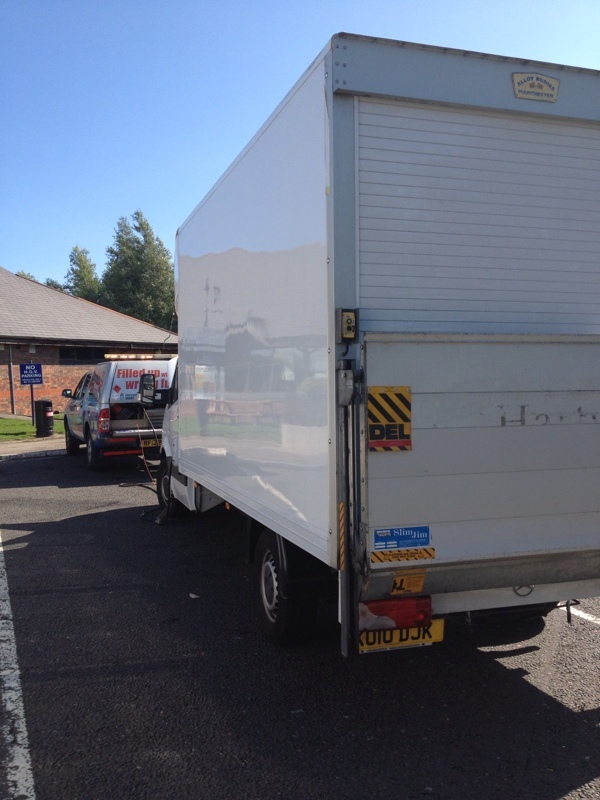 We attended this vehicle several weeks back but the customer realised her mistake on the Forecourt and called us. This time though she did not realise her mistake. She had driven the vehicle several miles before the vehicle came to a stop. She called us after realising her mistake of 'filling up with the wrong fuel'. Our technician attended the Ford Cmax and went to open the bonnet but the bonnet cable failed and had previously been snapped. The cable had snapped from under the bonnet so their was no way of opening the bonnet. We recovered the car to a local garage (Sacriston Car Care, County Durham) where their vehicle mechanic assisted in opening the vehicles bonnet. Forecourt Assists technician was confident enough to get the bonnet open but the problem would still be there after we had completed the 'wrong fuel removal'. The only way to get this open was by removing the front bumper to get a clear view of the bonnet catch. Eventually the garage got the bonnet catch open and the garage fitted a new lock and bonnet cable. 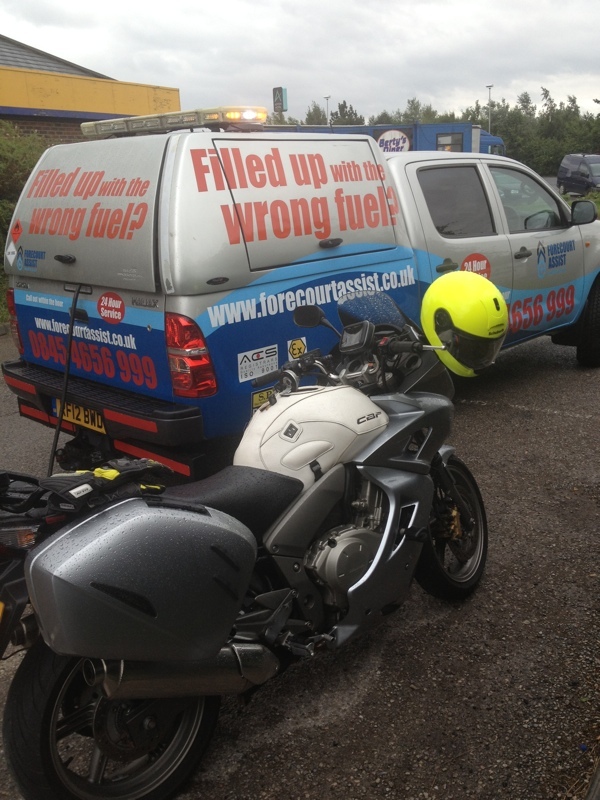 Forecourt Assist removed all the mixed fuel from the fuel tank and re-flushed the engine. The customers car was then put back together and given back to her. She was 100% happy with the work carried out on both parties. Another Diy Fuel Drain that has gone wrong. Well here we have a transit van that was the pride and joy of the two brothers as it is used as a part camper van when they go away dirt bike riding. 4 days earlier the brothers had accidentally put £15.00 of petrol into their diesel transit van. 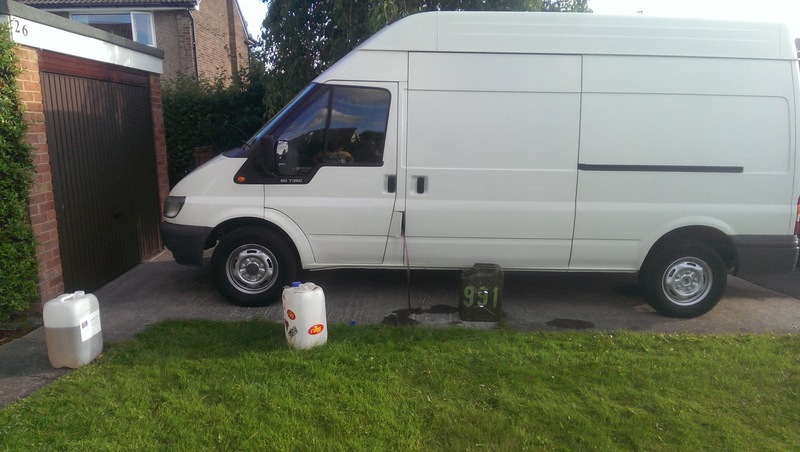 the had been running the vehicle with the wrong contaminated fuel hoping it would be ok. it was not until day three when the vehicle started to show signs of contaminated fuel when it started with a smoking engine and juddering round the street. it was at this point that the boys realised they were not going to ignor putting the wrong fuel in their car after all. We were called out to this vehicle in County Durham. On arrival the technician noticed 2 traffic wardens around it. The technicians first thoughts was that it was getting a big yellow fine sticker on the windscreen as the vehicle had broke down on double yellow lines.......in fact this was not the case but the vehicle did belong to the traffic wardens. They had been out working when they returned to their vehicle which did not start as good as it should have. When they got the vehicle engine started they drove until it came to a stop that's when they realised their mistake of "misfueling" their work vehicle. The traffic warden who "filled up the vehicle with the wrong fuel" has his own vehicle at home which is a petrol car giving him this reason for "filling up with the wrong fuel". The traffic warden was more angry that he had to pay for this out of his own pocket because the company said it was his fault. 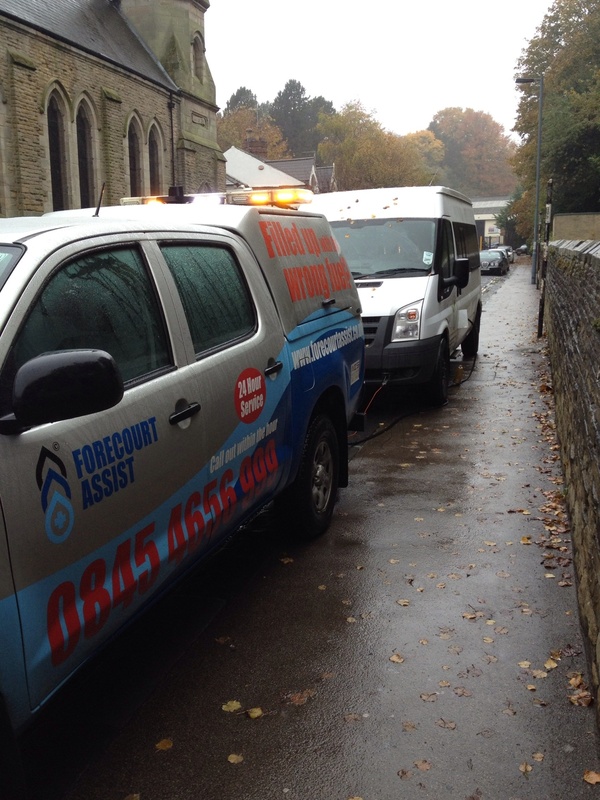 By the time "Forecourt Assist" received the call it took 15 mins to get to the vehicle and 25 mins to complete the job. These traffic wardens went on with their day. Over a period of time we have noticed that our business has been most useful for our friends the Americans. It is only recently that I have found out that over in united states that some of the pumps for petrol fuel actually have a Black pump handle. Over in the UK we all know that green is petrol and black is diesel but in America this is not the case. If you have filled up with the wrong fuel call Forecourt Assist on 0845 46 57 999. Covering UK, 24hrs 7 days a week.